Chivalry! In our day and age, the word takes us back to a time of knights and monarchs long past, but what does the word really mean? 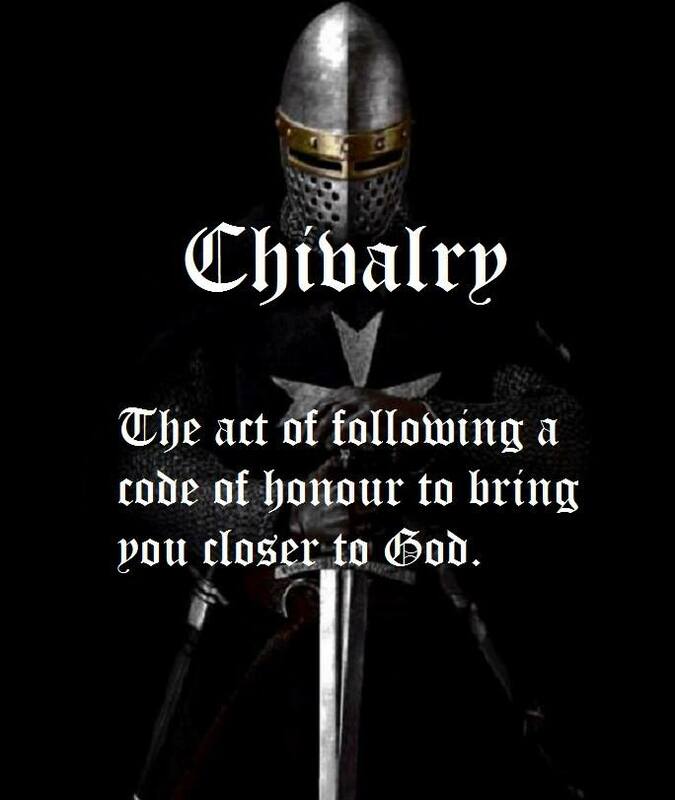 Kenelm Digby wrote that "chivalry is only a name for that general spirit or state of mind which disposes men to heroic and generous actions and keeps them conversant with all that is beautiful and sublime in the intellectual and moral world." It was an ideal for which men lived, and for which, if necessary, they would gladly die. Robert Kane, S.J., says "Without chivalry, wealth has no worth, pleasure no charm, fame no fascination, success no crown. Without it, prosperity crumbles to the value of the dust, and all the finer flowers of human life wither beneath the breath of bitter but just contempt. With it misfortune may become noble, suffering worshipful, disaster magnificent. It can give trifles a preciousness greater than gold can buy; it can give to trifles a preciousness greater than gold can buy; it can transform hardship into happiness; and round the worst failure it can throw the glory of a true triumph. For, ideal though it be, it has a strange practical power. It is the one test which inexorably unmasks the liar, the knave, or the animal amongst men, and which faithfully reveals the true, the good, and the noble. It is Honor." "Honor has a triple aspect, as it regards truth, right, and conduct. It means the highest reverence for truth, the deepest devotedness to right, and the brightest chivalry in conduct. Honor is a chivalrous allegiance, and enthusiastic loyalty, a death-daring devotedness to what in truth is most delicate and to what in right is most refined. a man of honor is a hero of the highest type and of the most sterling worth." It is a light which grows brighter as the gloom and darkness of the world grow blacker, a "light that had been kindled within men's souls by a fire that came from heaven, the light of Honor that was fanned by divine faith till it reached the glorious radiance of Christian Chivalry." It is the sublime faith and the holy discipline of the Catholic Church which can enable the soul of man to gain the highest degree of elevation of which it is capable in its present state of exile. Finally, Kenelm Digby tells us, "It is the motive rather than the action which is peculiar to the religion of Jesus Christ. Now the religion of Chivalry was altogether the religion of motives and of the heart. it was love, faith, hope, gratitude, joy, fidelity, honor, mercy; it was a devotion of mind and strength, of the whole man, of his soul and body, to the discharge of duty and to the sacrifice of every selfish and dishonorable feeling that was opposed to duty; it was to obey a commandment which was in unison with all the elevated sentiments of nature and calculated most effectually to develop every quality that ought to be the object of esteem and reverence. 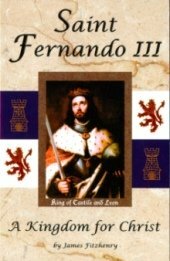 The knights of old had neither the inclination nor the ingenuity to determine the minimum of love which was compatible with the faith of Christ. They were not like men who think it enough if they love God at any time before death or on the festivals, or if they keep the commandments and do not hate God, or who imagine that this burdensome obligation of loving Him was part of the Mosaic law which is dispensed with by the religion of nature and the Gospel. Their affections were warm, their gratitude was sincere; and, though their understanding as to the doctrines of religion might sometimes fail them, their hearts did not. They were thankful under every circumstance of life; and, in the words of the prophet of old, it was their boast: For the fig-tree shall not blossom: and there shall be no spring in the vines. The labor of the olive-tree shall fail: and the fields shall yield no food: the flock shall be cut off from the fold, and there shall be no herd in the stalls. But I will rejoice in the Lord: and I will joy in God my Jesus." Thank you to Ryan M. Reeves (PhD Cambridge), Assistant Professor of Historical Theology at Gordon-Conwell Theological Seminary.